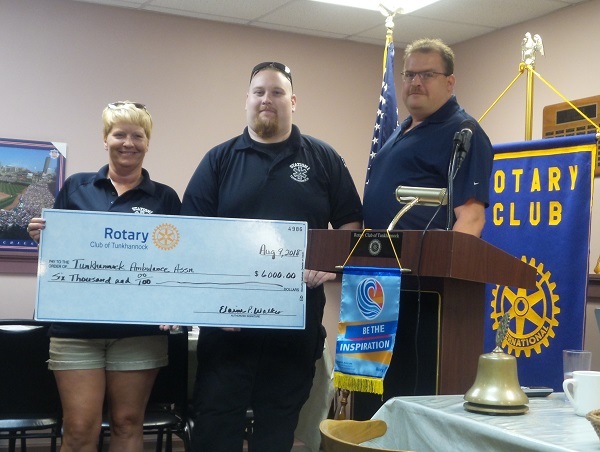 At a recent Rotary meeting, President Mike Markovitz presented a grant for $6,000 to Amy Markovitz and Ben Hall from the Tunkhannock Community Ambulance Association (TCAA). The money is a Tunkhannock Rotary grant to the TCAA for the purchase of a QCPR system, including a Rescue Annie and Baby, which are electronic mannequins for use in training first responders and community members on proper techniques for cardiopulmonary resuscitation. The new mannequins will feed back to a computer and it will tell them how good they are with their chest compressions including: compression depth, compression rate, hand placement and other salient facts. This system will give the best life-saving CPR training available. Tunkhannock Rotary applied for a Rotary District Grant of $4,000 and added $2,000 from the Club to make this grant possible. This is one of many projects funded from the proceeds of the Annual Harvest and Wine Festival, which will take place this year on Oct 13, 2018 at Lazybrook Park.